CDS Manufacturing designed and built this system to automatically sort spherical parts for flats, clusters, doubles, and debris. This system is fully adjustable and allows the operator to set up the system for the quality level they wish to attain. 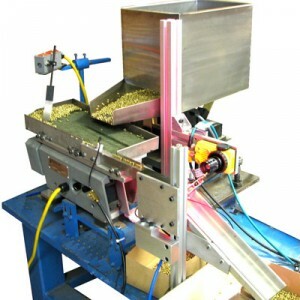 The operator loads parts into the bulk reservoir in the corner of the sorting system. Parts are then fed out onto the sorting surface. The worst quality parts, such as clusters, parts with flats, and debris, feed out the end of the system. Better quality parts peel off into one of the two fallout areas on the side of the system. The best quality parts travel to the back of the system. Fallout from each of the categories is stored in stainless steel storage bins.